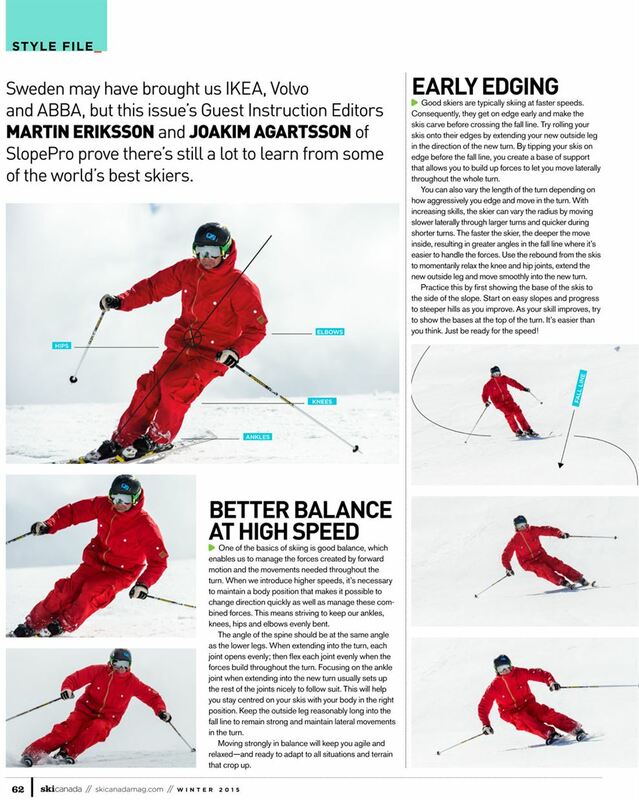 WINTER 2015 .. Sweden may have brought us IKEA, Volvo and ABBA, but this issue’s Guest Instruction Editors Martin Eriksson and Joakim Agartsson of SlopePro prove there’s still a lot to learn from some of the world’s best skiers. One of the basics of skiing is good balance, which enables us to manage the forces created by forward motion and the movements needed throughout the turn. When we introduce higher speeds, it’s necessary to maintain a body position that makes it possible to change direction quickly as well as manage these combined forces. This means striving to keep our ankles, knees, hips and elbows evenly bent. The angle of the spine should be at the same angle as the lower legs. When extending into the turn, each joint opens evenly; then flex each joint evenly when the forces build throughout the turn. Focusing on the ankle joint when extending into the new turn usually sets up the rest of the joints nicely to follow suit. This will help you stay centred on your skis with your body in the right position. Keep the outside leg reasonably long into the fall line to remain strong and maintain lateral movements in the turn. Moving strongly in balance will keep you agile and relaxed—and ready to adapt to all situations and terrain that crop up. Good skiers are typically skiing at faster speeds. Consequently, they get on edge early and make the skis carve before crossing the fall line. Try rolling your skis onto their edges by extending your new outside leg in the direction of the new turn. By tipping your skis on edge before the fall line, you create a base of support that allows you to build up forces to let you move laterally throughout the whole turn. You can also vary the length of the turn depending on how aggressively you edge and move in the turn. With increasing skills, the skier can vary the radius by moving slower laterally through larger turns and quicker during shorter turns. The faster the skier, the deeper the move inside, resulting in greater angles in the fall line where it’s easier to handle the forces. Use the rebound from the skis to momentarily relax the knee and hip joints, extend the new outside leg and move smoothly into the new turn. Practice this by first showing the base of the skis to the side of the slope. Start on easy slopes and progress to steeper hills as you improve. As your skill improves, try to show the bases at the top of the turn. It’s easier than you think. Just be ready for the speed! When skiing at higher speeds, the forces on your body will be greater. In order to handle these increased forces, you need to focus on how the leg and hip work together. 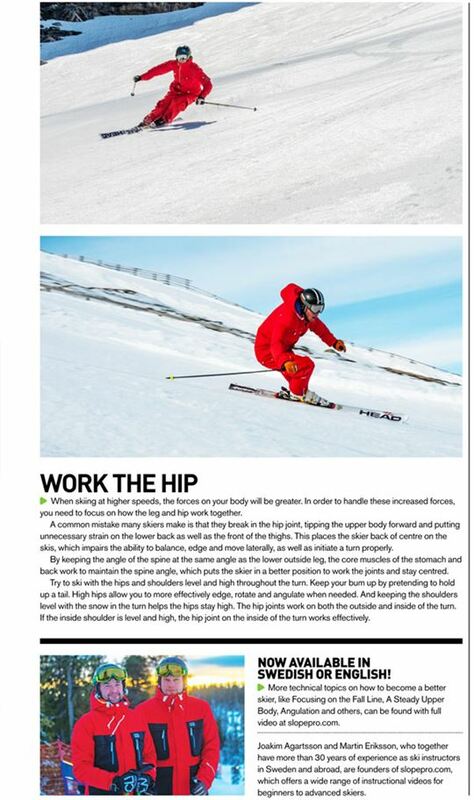 A common mistake many skiers make is that they break in the hip joint, tipping the upper body forward and putting unnecessary strain on the lower back as well as the front of the thighs. This places the skier back of centre on the skis, which impairs the ability to balance, edge and move laterally, as well as initiate a turn properly. By keeping the angle of the spine at the same angle as the lower outside leg, the core muscles of the stomach and back work to maintain the spine angle, which puts the skier in a better position to work the joints and stay centred. Try to ski with the hips and shoulders level and high throughout the turn. Keep your bum up by pretending to hold up a tail. High hips allow you to more effectively edge, rotate and angulate when needed. And keeping the shoulders level with the snow in the turn helps the hips stay high. The hip joints work on both the outside and inside of the turn. If the inside shoulder is level and high, the hip joint on the inside of the turn works effectively. Now available in Swedish or English! More technical topics on how to become a better skier, like Focusing on the Fall Line, A Steady Upper Body, Angulation and others, can be found with full video at slopepro.com. Joakim Agartsson and Martin Eriksson, who together have more than 30 years of experience as ski instructors in Sweden and abroad, are founders of slopepro.com, which offers a wide range of instructional videos for beginners to advanced skiers.